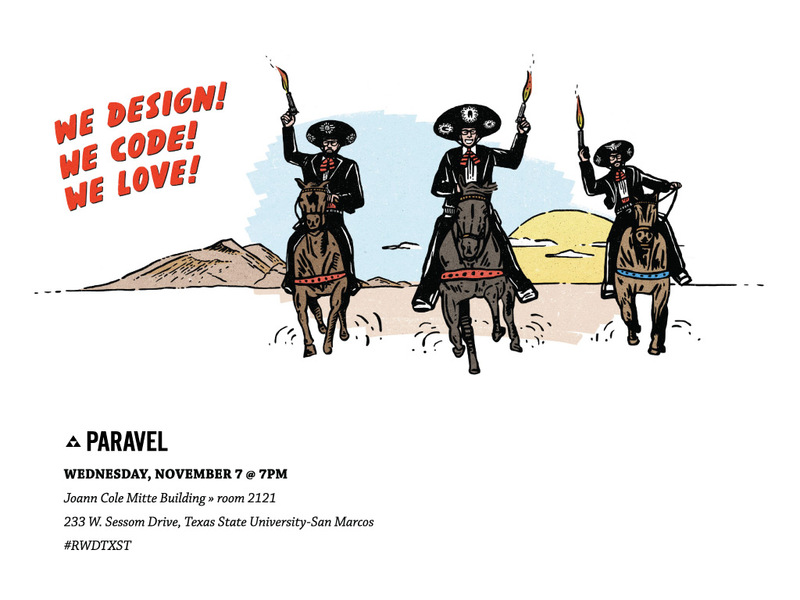 I’m so excited to announce that on November 7th, at 7pm, Trent Walton, Dave Rupert, and Reagan Ray of Paravel Inc, an Austin-based interactive shop, will be dropping by Texas State to discuss Responsive Web Design and their latest projects such as the new RWD homepage for <a href=”http://www.microsoft.com>Microsoft</a>. Leading the wave of mobile-friendly and Responsive Web Design, they worked on initiatives such as Lost World Type, Heroes of Texas, ATX Web Show Podcasts, DoLectures, and organize Dribbble.com meet ups for the city of Austin. Most recently, they redesigned Microsoft.com. They have contributed chapters to design publications such as Insites: The Book, The Manual (book series), 8Faces Magazine, and A List Apart. They created collections of helpful RWD codes now used by our students and industry designers as the industry standard. I am so excited to have them visit and talk to our students. The lecture is open to public! Hope you can make it!